Jarod M. Hanson, DVM, DACVPM, is a Major on active duty in the US Army Veterinary Corps. He is completing his PhD in infectious diseases at University of Georgia, where he studies species differences that influence influenza A virus infection outcomes. Dr. Hanson has taught large animal virology at University of Georgia. After earning his DVM from University of Minnesota, he focused on swine medicine and has continued pursuing the advancement of population-based veterinary medicine across multiple species. Ralph A. Tripp, PhD, is co-director of University of Georgia Center for Molecular Medicine and associate director of University of Georgia Biomedical Health Sciences Institute. He is an adjunct professor at multiple universities and serves as the Georgia Research Alliance chair in vaccine and therapeutic studies. He has published more than 200 journal articles, holds 13 patents, has written or edited numerous books and chapters, and has formed 4 companies focused on biomedical solutions. Stephen B. Harvey, DVM, MS, DACLAM, is an associate professor of population health and the assistant director for Animal Resources at University of Georgia, as well as a Lieutenant Colonel in the US Army Reserve. Dr. Harvey’s work is primarily focused on maintaining the health and humane care of laboratory animals. After earning his DVM from Purdue University, he completed a residency and earned his master’s in laboratory animal medicine at Pennsylvania State University. 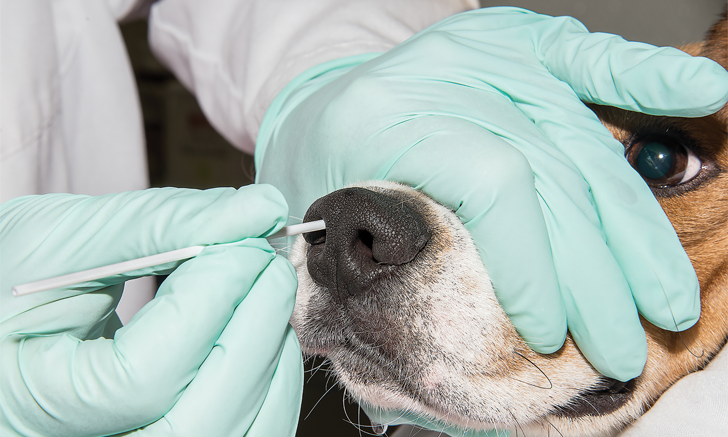 Nasal swabbing is the preferred antemortem sample collection technique for diagnosing acute influenza infection caused by canine influenza virus. Although oropharyngeal swabs have been recommended in several species,1-3 nasopharyngeal swabs are as or more likely to identify influenza-infected animals and are the current standard for sample collection in multiple species (eg, humans, pigs).4-9 However, nasal swabs are preferred over nasopharyngeal or oropharyngeal swabs in dogs because of the inherent difficulty of obtaining high-quality swabs from the pharyngeal region caused by poor visibility of the target area, especially in large or brachycephalic breeds. In addition, the enhanced sensitivity of newer reverse transcription polymerase chain reaction (RT-PCR)-based influenza assays enable detection of small quantities of virus. 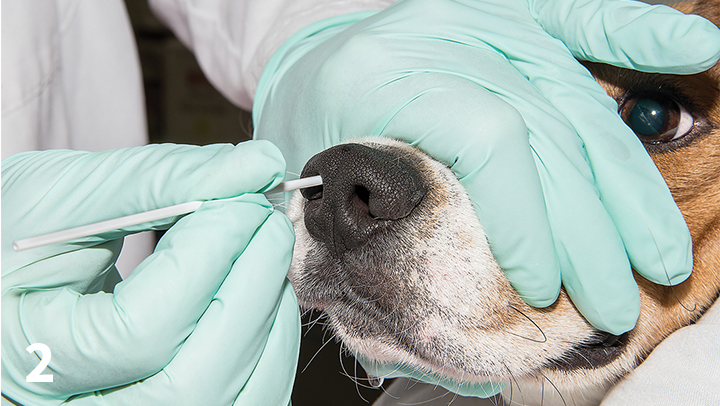 Nasal swabs are also safer, as the dog can be muzzled during the procedure. Additionally, as with the recent H3N2 canine influenza virus (CIV) outbreak, false-negative results may occur when a new strain of influenza emerges. Properly collected nasal swabs can be used for virus isolation, regardless of influenza type, allowing for detection and subsequent characterization of new virus isolates through sequencing and development of PCR assays. This decreases the time needed for diagnostic tests for a given influenza strain and to select an updated vaccine based on the newly identified strain(s). Influenza replication occurs almost exclusively in epithelial cells lining the respiratory tract. 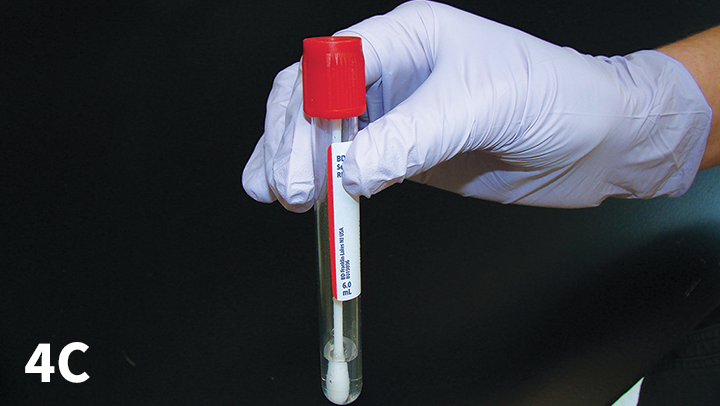 Therefore, although swabs of the external nares may be useful for detecting diseases such as leishmaniasis, in which the agent lives in the mucocutaneous region,1,10 influenza sampling necessitates a much deeper swab technique to collect virus. To optimize CIV detection, swabs of the distal nasal cavity should be obtained. 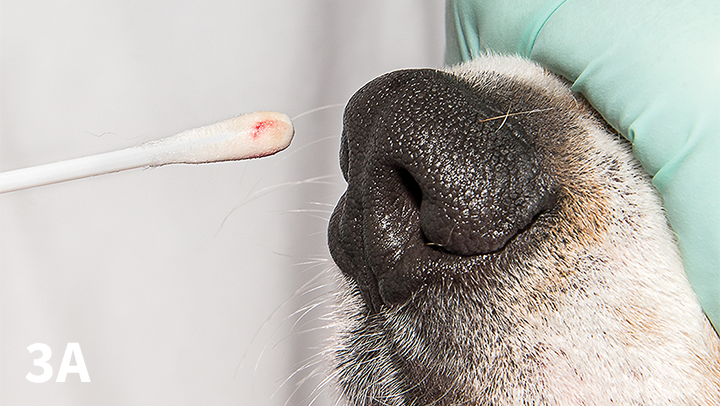 Nasal swabs are preferred over nasopharyngeal or oropharyngeal swabs in dogs. Avoid using wooden, paper, or aluminum wire handles because of the potential for residual chemicals to inactivate and/or degrade viral particles collected on the swab.15 Wooden handles are also more prone to break. Wire handles tend to bend during insertion, especially if the animal is not adequately restrained and the swab head is too small to adequately contact nasal epithelium; this can lead to poor virus recovery. 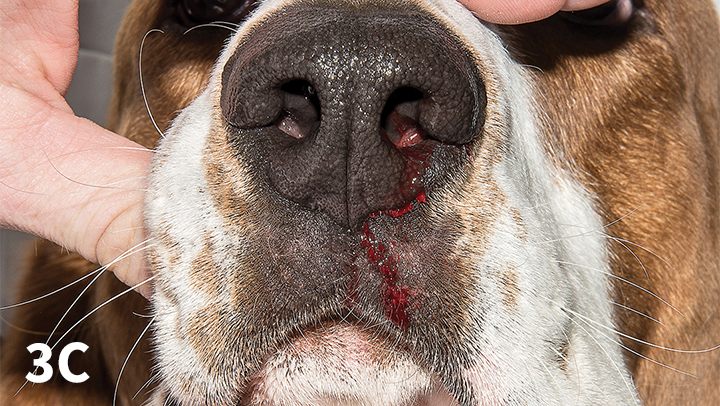 Wire swabs may be useful, however, in pediatric or small-breed patients, in which small nasal passages may hinder introduction of a larger-diameter swab without significant trauma. Do not use wooden-handled swabs on live animals. Restraint is critical to prevent a swab from breaking in the nasal passage. It may take several veterinary team members to adequately restrain an unsedated dog to ensure its head remains still during swabbing. A swab that breaks off in the nasal passage can often be removed with a hemostat. Sedation should be used with caution in canine patients exhibiting respiratory compromise and/or distress. With the dog muzzled,* place the swab parallel to the dog’s nose so that it extends to the medial canthus of the eye (Figure 1). This is the maximum depth the swab can be inserted into the nasal cavity. This distance varies with the length of the dog’s nose. Avoid premoistening the swab, as this limits absorptive capacity and can result in lower sample recovery. *Muzzle was removed for photographs to provide better visualization. Hold the stick portion of the swab at the measured length to ensure the swab has been inserted as far as possible (Figure 2), which maximizes contact with the respiratory epithelium. To help minimize mucosal damage, quickly but gently twist the swab around its axis as it is advanced into the nasal cavity. Direct the swab upward and toward the midline to minimize trauma as it passes through the external nares into the nasal passages. Inserting the swab takes a fair amount of pressure, so speed is essential to minimize patient irritation and minimize the potential for swab breakage if the patient is not adequately restrained. Never reuse a bent swab. Swab both nasal passages; the same swab can be used for both sides, although this may increase the risk for handle breakage. If 2 swabs are used, they can be combined in the same tube. 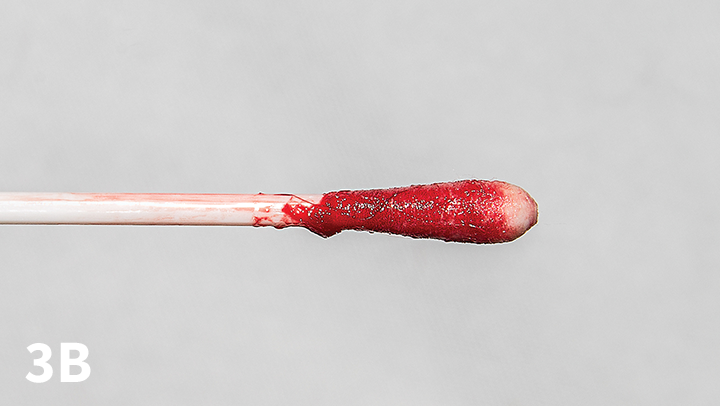 A small amount of blood on the swab is normal (Figure 3A). Larger amounts may be seen due to inflammation of the nasal epithelium (Figure 3B). If a large amount of blood is present on a single swab, place that swab in a tube by itself. Most dogs will have a small amount of blood-tinged discharge (Figure 3C) and may sneeze blood intermittently following swabbing. Epistaxis may also occur for several minutes after the procedure but is usually self-limiting. 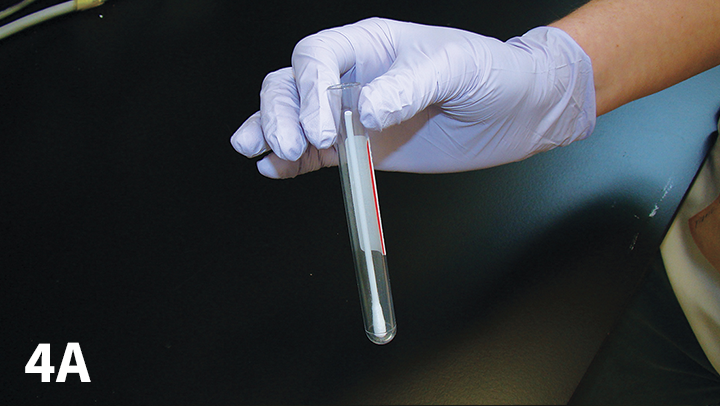 Place the swab into a sterile red-top or similar sterile leak-proof container (Figure 4A). Cap the tube, making sure the swab handle is not contacting the cap, as this can cause leakage. If the handle is too long, shorten it as needed. 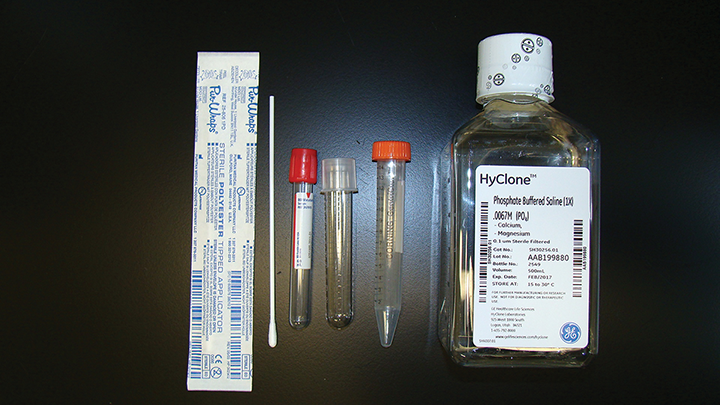 Add ≈1 mL of sterile physiologic saline solution (eg, surgical saline, 0.9% IV saline solution) to the tube to help prevent sample desiccation if a commercial virus or bacteria collection system that contains a liquid medium is not used; ensure the entire swab tip is submerged in liquid (Figure 4C). When using virus transport or sterile culture swabs, the swab handle does not need to be shortened and should be inserted into the included media tube as-is. 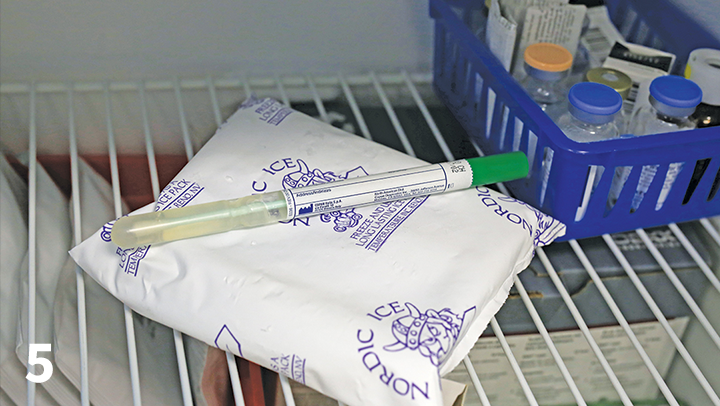 Store the sample(s) on ice (not dry ice) or at 39.2°F (4°C) in a refrigerator immediately after collection (Figure 5). Ship the samples on ice packs overnight to the receiving laboratory—the same day if possible and preferably no later than the next day. Do not freeze samples, as freezing can hinder recovery of live virus. Samples may be refrigerated for several days then shipped if necessary, but this can increase the potential of a false-negative virus isolation test result. Because RT-PCR is generally unaffected, samples can be tested this way in a majority of cases, regardless of shipping delays. Ensure the recipient laboratory is testing for both the H3N8 and H3N2 influenza A strains. All tools, equipment, and contact surfaces (eg, muzzles, examination tables) should be disinfected appropriately after use on suspected influenza cases to prevent potential virus transmission to subsequent patients. Clinical influenza can be caused by many virus subtypes, all with unique species predilections. Crossover and subsequent adaptation of viruses among species remains an ongoing concern, although current canine influenza variants do not appear to readily cross back to other species. 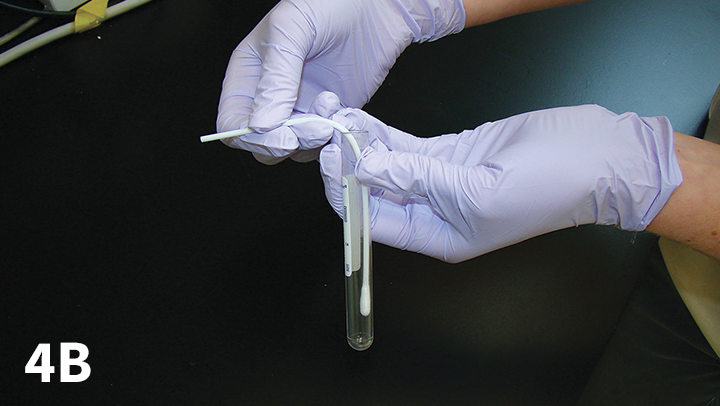 Nasal swabbing is an excellent diagnostic tool for identifying acute influenza infections, but it requires the right combination of swabs and technique to yield high-quality samples suitable for PCR, virus isolation, and other diagnostic tests. Animal use was conducted under approval by the Animal Care and Use Committee of the University of Georgia, an institution accredited by the Association for Assessment and Accreditation of Laboratory Animal Care (AAALAC) International. de Almeida Ferreira, Almeida GG, de Oliveira Silva S, et al. 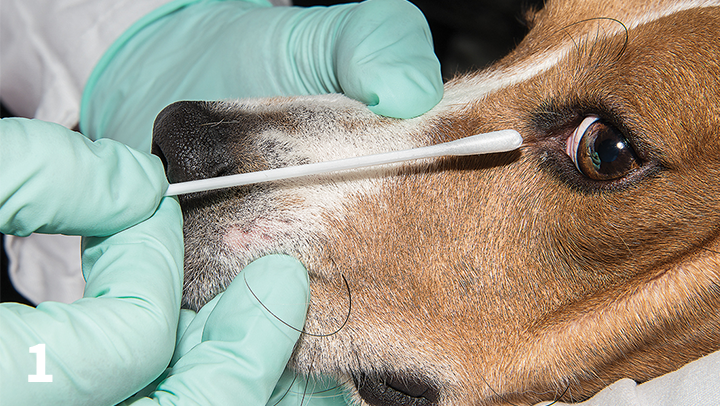 Nasal, oral and ear swabs for canine visceral leishmaniasis diagnosis: new practical approaches for detection of Leishmania infantum DNA. PLoS Negl Trop Dis. 2013;7(4):e2150. Anderson TC, Crawford PC. Diagnosing H3N8 CIV infection. Clinician’s Brief. 2011;9(10):69-72. Lieberman D, Lieberman D, Shimoni A, Keren-Naus A, Steinberg R, Shemer-Avni Y. Identification of respiratory viruses in adults: nasopharyngeal versus oropharyngeal sampling. J Clin Microbiol. 2009;47(11):3439-3443. Spackman E, Pedersen JC, McKinley ET, Gelb J Jr. Optimal specimen collection and transport methods for the detection of avian influenza virus and Newcastle disease virus. BMC Vet Res. 2013;9:35. Ginocchio CC, McAdam AJ. Current best practices for respiratory virus testing. J Clin Microbiol. 2011;49(9 Suppl):S44-S48. Janke BH. Diagnosis of swine influenza. J Swine Health Prod. 2000;8(2):79-84. Grijalva CG, Griffin MR, Edwards KM, et al. Concordance between RT-PCR–based detection of respiratory viruses from nasal swabs collected for viral testing and nasopharyngeal swabs collected for bacterial testing. J Clin Virol. 2014;60(3):309-312. Hernes SS, Quarsten H, Hagen E, et al. Swabbing for respiratory viral infections in older patients: a comparison of rayon and nylon flocked swabs. Eur J Clin Microbiol Infect Dis. 2011;30(2):159-165. Ngaosuwankul N, Noisumdaeng P, Komolsiri P, et al. Influenza A viral loads in respiratory samples collected from patients infected with pandemic H1N1, seasonal H1N1 and H3N2 viruses. Virol J. 2010;7:75. Baron EJ, Miller JM, Weinstein MP, et al. A guide to utilization of the microbiology laboratory for diagnosis of infectious diseases: 2013 recommendations by the Infectious Diseases Society of America (IDSA) and the American Society for Microbiology (ASM)(a). Clin Infect Dis. 2013;57(4):e22-e121. Esposito S, Molteni CG, Daleno C, et al. Comparison of nasopharyngeal nylon flocked swabs with universal transport medium and rayon-bud swabs with a sponge reservoir of viral transport medium in the diagnosis of paediatric influenza. J Med Microbiol. 2010;59(Pt 1):96-99. Druce J, Garcia K, Tran T, Papadakis G, Birch C. Evaluation of swabs, transport media, and specimen transport conditions for optimal detection of viruses by PCR. J Clin Microbiol. 2012;50(3):1064-1065. Gibb AP, Wong S. Inhibition of PCR by agar from bacteriological transport media. J Clin Microbiol. 1998;36(1):275-276. CDC flu sample collection guidelines. Centers for Disease Control and Prevention website. http://www.cdc.gov/h1n1flu/specimencollection.htm#D. Accessed May 5, 2016. Wadowsky RM, Laus S, Libert T, States SJ, Ehrlich GD. Inhibition of PCR-based assay for Bordetella pertussis by using calcium alginate fiber and aluminum shaft components of a nasopharyngeal swab. J Clin Microbiol. 1994;32(4):1054-1057. Hause BM, Collin EA, Liu R, et al. Characterization of a novel influenza virus in cattle and swine: proposal for a new genus in the Orthomyxoviridae family. mBio. 2014;5(2):e00031-14. Song D, Kang B, Lee C, et al. Transmission of avian influenza virus (H3N2) to dogs. Emerg Infect Dis. 2008;14(5):741-746. Song DS, An DJ, Moon HJ, et al. Interspecies transmission of the canine influenza H3N2 virus to domestic cats in South Korea, 2010. J Gen Virol. 2011;92(Pt 10):2350-2355. Cheng K, Yu Z, Gao Y, et al. Experimental infection of dogs with H6N1 avian influenza A virus. Arch Virol. 2014;159(9):2275-2282.